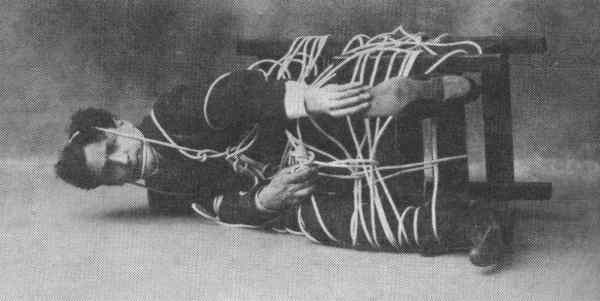 Many times Houdini would be tied with ropes often to various objects. Here is one where he is tied to a chair. He wrote a book on how to do rope escapes, and also explained it in several articles including one that was part of a series for Ladies Home Journal. Several books are available from the Houdini Museum, 1433 N Main Ave, Scranton, PA 18447 on rope escapes.